Yesterday, Apple pushed out firmware for its $349 HomePod smart speaker ahead of the device's launch in December, and developer Steve Troughton-Smith has been sharing some interesting tidbits online that he managed to unearth in the code. 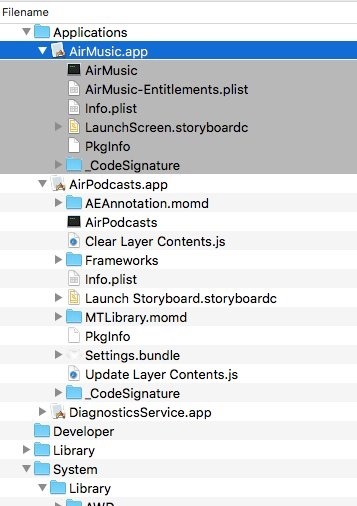 Bearing the name "AudioAccessory1,1", the firmware reveals that the HomePod runs a full iOS stack – essentially like an iPhone without a screen – and relies on a shell app called "SoundBoard" to integrate with the device's hardware. Troughton-Smith said that HomePod apps are prefixed with "Air" in the firmware, but that there currently appears to be no provision for third-party apps or extensions in the OS shell. In addition to revealing that the device will include Accessibility features like VoiceOver, Troughton-Smith also found references to an LED matrix, possibly relating to the area on the top of the speaker that with the right density could display shapes and/or symbols. Plus and minus symbols and a Siri button are known to be on the top of the device, so the existence of an LED matrix could potentially present additional information to the user, such as icons or a graphic equalizer. Oddly enough, the developer also found that the HomePod is identified as an iPhone SE in the iTunes Store. Apple is sure to make further changes to the software that runs the audio speaker before it ships in December, so we'll likely have to wait until then for the full lowdown on its functionality. In the meantime, you can learn more about the device by checking out the MacRumors HomePod roundup. I'm still confused by the HomePod. Apple doesn't have clear strategies with products anymore. Everything that Cook releases is vague, just like Apple Watch where they completely changed the interface, the marketing and targeting multiple times and they will do the same with HomePod. They're not thought out products. It's more like, let's realease it and see what happens. PLUS it feels like they are already behind, right from the start. Everybody is going to screens to display additional information. Just a music speaker that only works with Apple Music and with no real display for 349 plus taxes, I don't see it being a big hit. PLUS it feels like they are already behind, right from the start. Everybody is going to screens to display additional information. Just a music speaker that only works with Apple Music and with no real display, I don't see it being a big hit. So you say everything Cook releases is vague? You mean like the iPad that's been highly successful with the recent launch back in June, the Apple Watch that's been highly successful, not to mention the best selling smart phone in the world with the iPhone, the AirPods that have been back ordered since last December and have had stellar reviews. Sounds like those vague products are doing very well to me. Also, does that, shock you that Apple has not released their product first before others? It shouldn't. It Shouldn't be about being the first on the market, it should be about releasing the better product. They always are the last, but they always seem to put out the products that have more unique features. That's what makes Apple products stand out. The HomePod may not be the first smart speaker/Bluetooth home audio system on the market, but it certainly is going to bring quality sound and will sell out. HomePod is not a better speaker that other products, and not a btter home assistant thatn other products. It's not better at anything, not when it comes to technolgy and not when it comes to usabailty. So how much credibility is your post supposed to have based on the fact that you have no experience with the Home Pod? Let alone we don't even know its full potential based on "Usability." Question, have you personally tested the HomePod to make that assessment? It's a Steve Jobs product which has seen almost no improvements in 10 years. the only difference in terms of software (which means actual use) in 10 years is now we have sort of a baby drag and drop. That's it. And it is not "highly successful" either, sales have gone down for iPad every year. Because they didn't continue to innovate on it with Cook as CEO, as they should have. You mean like how just a few months ago, Apple was being criticised for being behind in AR, only to see that narrative completely turned on its head being ARkit being made available on hundreds of millions of iOS devices in a few months time? This is a clear case of Apple's long term product strategy hiding in plain sight. By the time Apple had revealed all the cards in their hand, it will have been all over for the competition. I don't dare to claim that I know everything that Apple is up to, but I can say one thing - Apple always has a plan, and one underestimates Apple to their own detriment. I think I'll wait for the Retina HomePod. Seriously though, why 32x32, when 256x256 would make it more of a classy device? It's a Steve Jobs product which has seen almost no improvements in 10 years. Completely false. And nor are you taking in the full retrospect of all the iPad capabilities. There may have been some stagnancy with the iPad, but with iOS 11 and the latest iPad Pros, they don't need to drastically change every single year to make it a successful product. Not to mention, what other competition does the iPad have from stopping it from being the best selling tablet on the market? Also, let's not compare Steve Jobs and Tim Cook. They're not the same CEOs and they obviously share different traits. What has he done, really? He's approaching 10 years as CEO. Steve Jobs came back to Apple in 1997 brought it back from the dead, came out with the iMac, the iPod, "created" OS X from scratch and introduced the iPhone by 2007. All in just 10 years and that doesn't even include things like the iBook, the first mainstream portable with integrated wireless and so on. What has Tim Cook done in his soon to be 10 years. 1 failing product. Oh and milking every dollar out of existing products. Not a great record. Those are the facts. Closer to six years actually. He took over in 2011. In his years as CEO, Tim Cook has achieved the following milestones as of end of last year. I'm still confused by the HomePod. I'm sure it's a lovely piece of hardware. But they support Sonos in their stores, open up Apple Music to Sonos - and then stop the integration and leave it in the air..... and then launch their own single speaker. Is it a personal assistant, or a single hit music speaker? The whole Sonos / Apple / HomePod area is still unclear to me. I think, these days, people have a mix of sources, Spotify, Amazon, radio feeds, Mixcloud, Soundcloud, Apple Music etc... but I don't see the HomePod having that diverse community of audio sources.